Hi everyone! 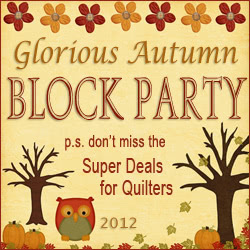 Welcome to Day 25 of our Glorious Autumn Block Party. 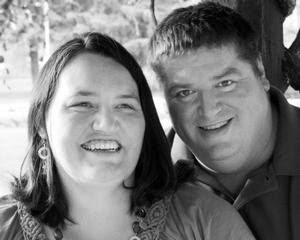 Today we have Richard and Tanya Healey as our featured designers and Super Deal savings from Eleanor Burns’ Quilt in a Day. Visit the Block Party Headquarters for more info and upload your completed blocks to the Flickr group. Quilt in a Day has everything you need to make a quilt – books, patterns, free block patterns, notions, fabric, rulers and videos. Quilt in a Day was founded in 1975 by “Hall of Fame” quilter, Eleanor Burns. Through out her career, Eleanor has published over 100 “How-to” quilt books, developed an Eleanor Burns Signature Pattern Collection and designed a variety of specialty rulers all produced to aid the quilter in successfully and easily completing their quilt. Her Quilt in a Day TV series began airing on PBS and is still broadcasting nationwide and abroad. Quilt in a Day’s Clearance Fabric is on sale for only $3/yard! 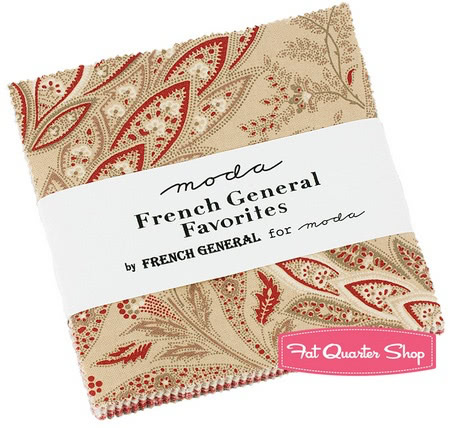 Choose from a variety of Quilt Shop favorites to add to your stash, including collections from Andover, Moda, Blue Hill Fabrics and much more! Shop early for best selection! No special code is required. Sale ends November 6 at 11:59 PST. 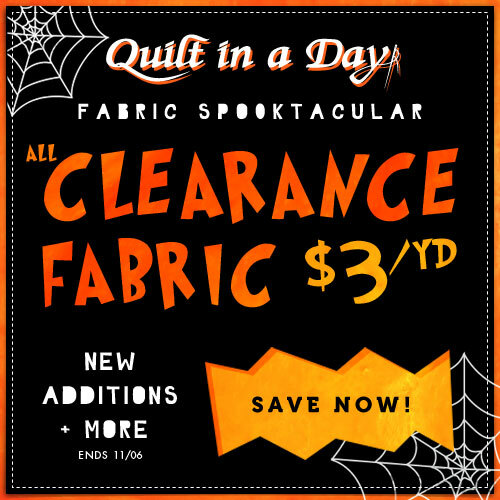 And for three days only, Quilt in a Day is having an additional Fabric Spooktacular! When you purchase 2 yards of Boutique fabric you will get the 3rd yard for FREE! Boutique fabric only; must be equal or lesser value. No special code is required. Sale ends November 1, 2012 at 11:59 PST. How did you get into quilting? Last year Tanya and I had decided to have another child. Back when my other kids were born we had family that quilted. I wanted a quilt for our new baby. I, of course, did what every guy does and that is I told my wife to make the new baby a quilt. Not the smartest think you can say to a pregnant woman. She told me that if I wanted a quilt that I would have to make my own. I started researching to see how hard it really was to make a quilt. I again started pestering Tanya to make a quilt. This time she did what any smart woman should do, she bought me a sewing machine. Then she proudly told me to make my own quilt. So that is what I did. 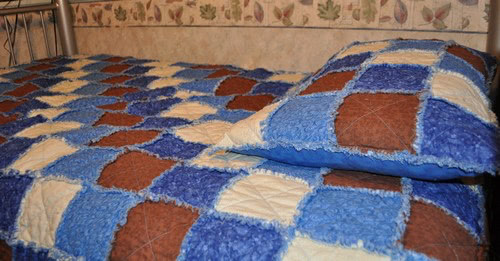 The first quilt I made was for lack of a better name called Blues and Browns (completed Jan 2, 2012). It was a simple Rag Quilt. After successfully creating this quilt, I then finally made what I had wanted to make from day one and that is a quilt for Julia (still not born at this time). I named this quilt Hearts and Flowers. This was our first “Design”. 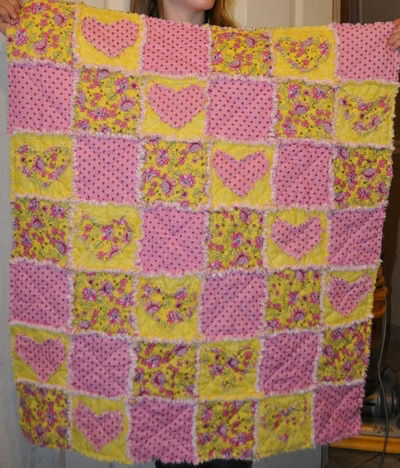 My wife loves hearts and I knew how to make rag quilts (at this time the whole concept of making a top and quilting it was just not in the cards). Tanya cut up a bunch of hearts and we appliqued them onto the rag quilt and ragged their edges. After completing this quilt I knew I had to make more. Soon after completing this quilt my other kids started demanding quilts of their own. Being a not so wise person, I declared that I would make a quilt for every member of my family (Including siblings and their kids). That is where I decided I could make 52 quilts in 52 weeks. This started my crazy quilting campaign. You might have thought that because Tanya helped me on that first quilt that she was a full participant in this craze I had going, but no she was a skeptic. For the first few months I would go buy fabric for each and every project I started and my wife would just shake her head at me. She kept wondering when I would just quit like every other crazy idea I have taken up in the past. It has been 10 1/2 months now since then and I am still going mad making quilts. Though a few things have changed. I now enjoy making more complicated items. 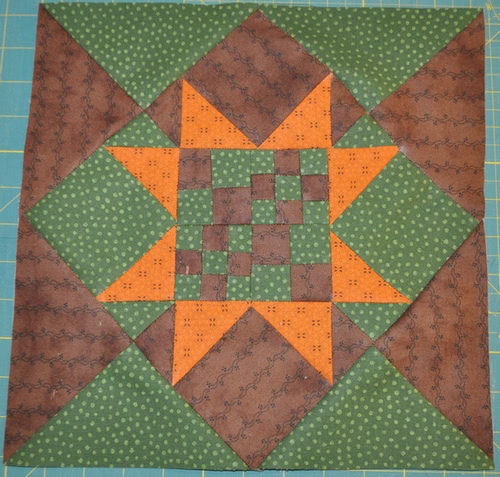 I have mostly stopped making rag quilts and now do more complicated pieced quilts. Another thing has changed is that Tanya is now fully a partner in our quilting. When I first started it was just Me at Richard Quilts. It was sometime in May or so when my 17 year old son changed the name displayed on my blog to Richard and Tanya Quilts instead of Richard Quilts. 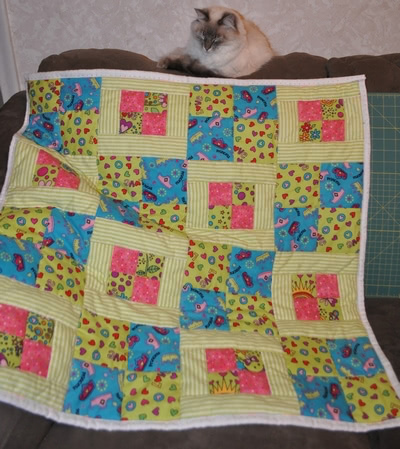 Tanya now has completed 2-3 quilts on her own, including a top she made on the beginner quilt along. I am still ahead a couple quilts though. Last time I counted I have made 56 (and yes I met my goal a little early). Though I realize I have gotten distracted and I still have a good 20 quilts to make for the family for Christmas. Wish me luck. How/when/why did you transition from a quilter to a designer? I transitioned from Quilter to Designer after my first quilt. Somehow just looking at and following a pattern was just not my thing. Like most guy’s we don’t like to follow directions, we would rather blaze our own trail. My 4th quilt “Train Wrek” (yes that is its name) is ample proof of how a great project can turn into a “Wrek” when you don’t make a plan. Which quilt is your favourite? Did you design it? Why is it your favourite? My favourite quilt so far is one of 3 quilts from the same pattern (yes designed by me) I call them “Color Blast” quilts. The first one I made was while my wife was in her last few weeks of pregnancy with Julia and I made it how can we say? Bright? Ugly? (what my wife called it) Wild? 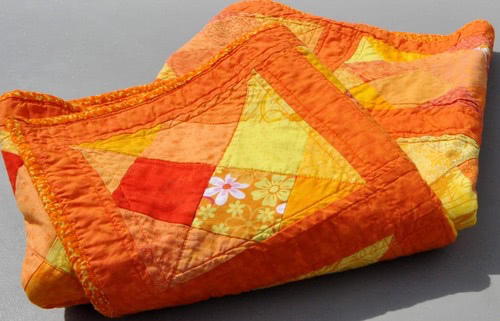 It is a bright Orange quilt. Done with a vanishing 16 block). In May, I bought my wife EQ7 for her birthday (can you say husband buys wife a present he wants here?) I have many times started to make a pattern to giveaway, but it is still not done and I am behind on quilting so it might be a while. 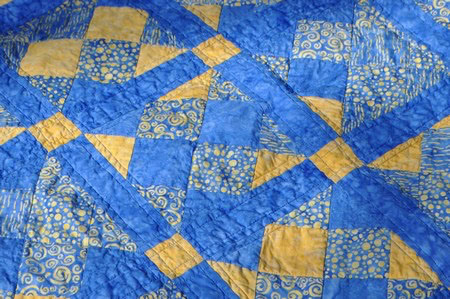 I since have made a blue and yellow version of this quilts in Batiks. Any way the Pattern and the quilts are my favorite. How many UFOs do you currently have? At least 15. What size of quilt do you prefer to make/design? (e.g. table runners, lap quilts, bed quilts, etc.) I have made mostly baby quilts and lap size quilts (for the Christmas presents). I like the smaller quilts as I can make them and quilt them on my home machine without stress. I think next year’s goal will be to go bigger. I have made 1 queen and 3 twins though. What colour do you use most often in your quilts? I am a fan of batiks and I love wild and bold as you can see in my Orange Color Blast quilt above. Favourite one-sentence tip for a new quilter: There are no rules. Make your quilts the way you want! Favourite size and brand of rotary cutter: 45 MM Olfa Rotary Cutter (the one without the squeeze handle, I hate those). Here’s Richard and Tanya’s block called Richard’s Star. Richard has also included a simplified version of the block’s centre. Head over to their block to download the block tutorial. 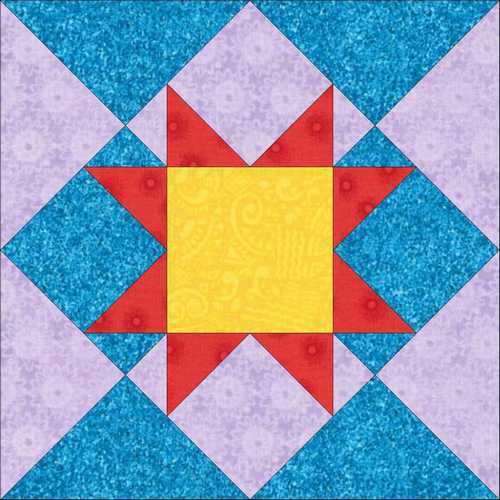 See the previous 24 free quilt blocks. Richard and Tanya are giving away a charm pack of “French General Favorites”. Head over to their blog to enter her give-away.